First published at the Duke Nicholas School of the Environment. While at the local Gulfarium to film educational interviews about sea turtle monitoring, I had the opportunity to go “behind the scenes” to meet the rescued turtles currently recuperating in their C.A.R.E. center. As I mentioned in a previous blog, the mission of the C.A.R.E. 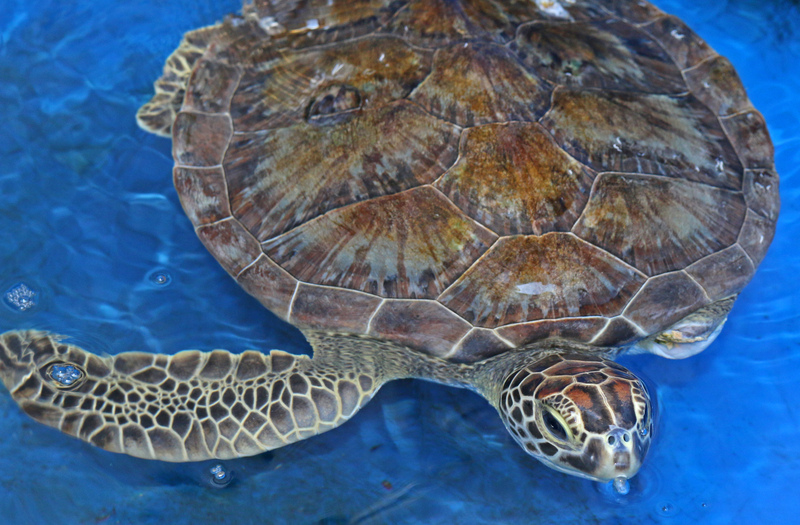 center is to conserve marine species, rehabilitate sea turtles, and educate others about the Gulf Ecosystem. Even I, who work with marine resources day in and day out, was about to see something new! In the first plastic tank a Green Sea Turtle swam in slow circles. Hit by a boat, her shell was cracked and a flipper missing. Still, vets believe the turtle will eventually heal, released back into the Gulf of Mexico once more. Moving forward, I saw my very first Kemp’s Ridley sea turtle, one of the most endangered sea turtle species in the world. There are only around 1000 individuals in the wild, so the survival of just one is critical for the species as a whole. This guy was a little skittish, remaining at the bottom of his tank and looking up at me through the bubbling, clear water. I find it difficult to describe the feeling I had when looking into the turtle’s eyes, a mix of sorrow but also hope for the future. At least this turtle was rescued and has a chance of successfully breeding once more! 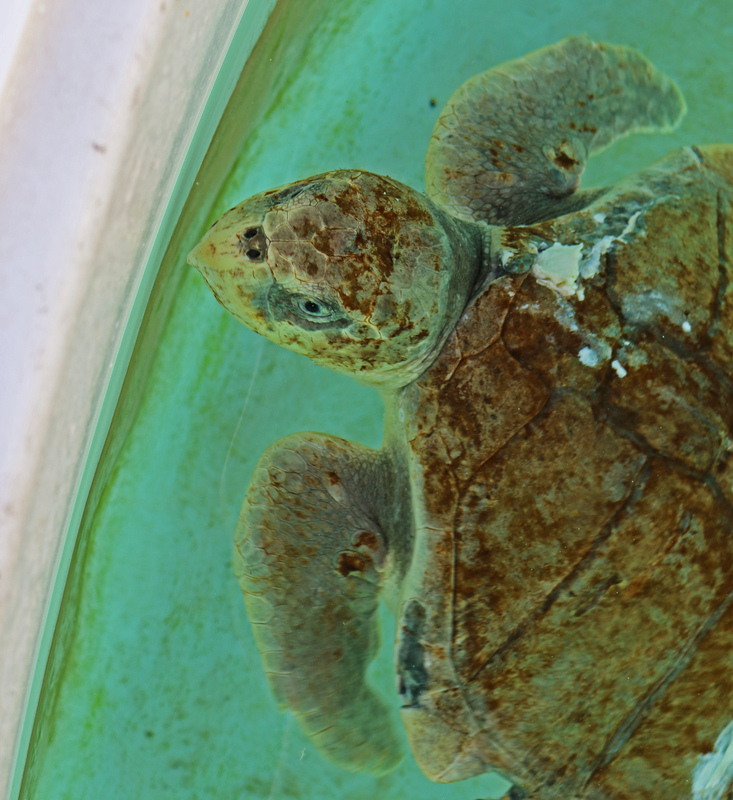 Last but definitely not least, a small Loggerhead turtle floated in a large bucket next to the Kemp’s Ridley tank. He was found when he was barely palm-size, and has now grown to the length of a football. Like the Green Turtle he was missing a flipper, but other than that acted like a bundle of energy, flapping vigorously when the vet took him out of the water. Yep, he’s ready to go home all right. Of course, there are always a few turtles the Gulfarium team cannot release. Floater and Bumper, their resident Loggerhead turtles, have developed air pockets in their shells that make it impossible for them to dive like they normally would. As a result, they remain where they can be cared for, and also where they can teach visitors and students about native sea turtles. Of the four species that are regularly spotted near where I live, I have yet to see a Leatherback. Here’s hoping I can spot this impressive species in the wild, and not at the Gulfarium!